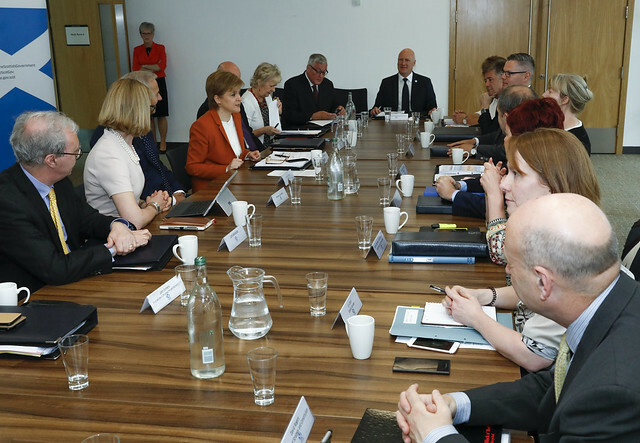 First Minister Nicola Sturgeon and her Cabinet met in the Clyde Gateway regeneration area as part of more than 40 Cabinet meetings that have taken place in towns and cities across Scotland, including Cupar, Dumfries, Aberdeen, Alloa, Inverness, Ullapool, Oban and Greenock. While visiting Clyde Gateway, the First Minister announced £5.5 million investment for the regeneration programme to help create jobs and attract private investment to the area. This funding underlines the Scottish Government’s long-term commitment to Clyde Gateway over the term of this Parliament. It will act as a catalyst for investment and deliver a physical, social and economic transformation of what has historically been one of the most deprived areas in Scotland. Cabinet Secretaries also took part in a full day of events to mark a decade of investment in the area. The First Minister and the Cabinet then took part in a public discussion at the Emirates Arena.